Nashville, TN (June 3, 2013) – Breakout duo Florida Georgia Line debut the brand new music video for “Round Here” on CMT and CMT.com today (6/3) with subsequent re-airs promoted across all of CMT’s digital platforms and 5.3 million social media fans. 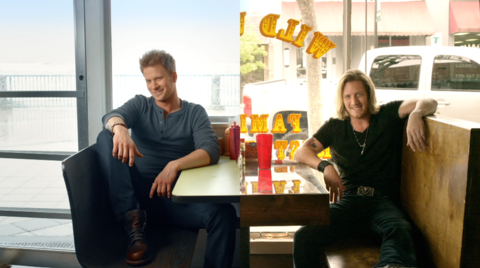 The video will air at the top of each hour throughout the morning in “double shot” rotation, paired with their recent hit videos “Cruise” and “Get Your Shine On.” The 24-hour, exclusive world premiere will highlight FGL’s hometowns of Ormond Beach, Florida (Brian Kelley) and Monroe, Georgia (Tyler Hubbard). The two-day shoot with Director Peter Zavadil captured several scenes in each city, featuring the duo’s family and friends as well as some of their favorite hangouts. Using visual elements to show the duality of their backgrounds, the video also depicts what unifies their “country boy charm” – performing for a crowd, beautiful girls, cool cars and a “here’s to the good times” attitude. “Round Here” is the follow-up to FGL’s consecutive, multi-week #1 hits – the recently PLATINUM-certified “Get Your Shine On” and TRIPLE-PLATINUM-selling debut “Cruise,” whose remix (featuring Nelly) has ascended into the Top 10 on the Top 40 chart. According to Billboard, “FGL is the first duo in 21 years to top the Country airplay charts with their first two singles,” from their GOLD-certified Republic Nashville debut album, HERE’S TO THE GOOD TIMES. FGL is nominated for three 2013 CMT Music Awards, including Video of the Year; Duo Video of the Yearand Breakthrough Video of the Year, as well as the Nationwide “On Your Side” Award for the best new live act in Country music. The awards show will air live from Nashville on June 5 at 8P ET/PT on CMT andCMT.com. The hot newcomers also scored a Teen Choice Awards nomination for Choice Country Group. Fans ages 13-19 can vote once a day via teenchoiceawards.com, leading up to the show on August 11 at 8P ET on FOX. Garnering buzz among fans, media and several Superstars across genres – including Taylor Swift, Keith Urban and Ed Sheeran – the ACM New Artist of the Year and New Vocal Duo/Group of the Year winners are currently touring with Luke Bryan’s DIRT ROAD DIARIES TOUR and Swift’s THE RED TOUR. VEVO has also selected FGL for the coveted LIFT program, offering exclusive content across the world’s leading all-premium music video and entertainment platform. Watch some of their pieces from the road here: vevo.com/c/en/US/lift#USUV71301128.